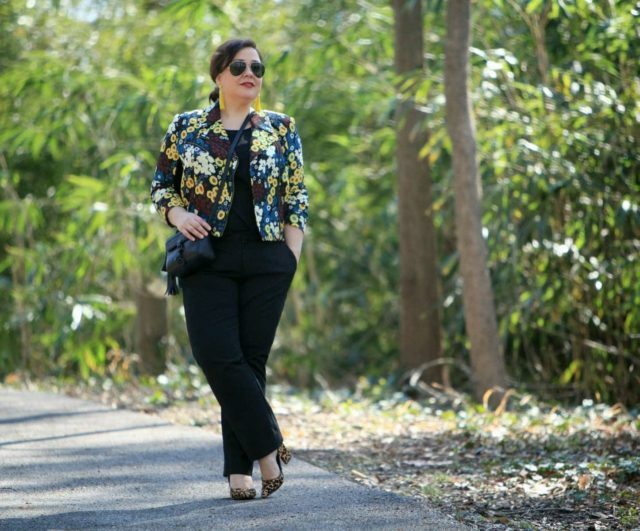 I first saw this Rachel Roy floral moto jacket on my friend Jeniese at the blog The Jesesaisquoi and swooned. Then it arrived in my Gwynnie Bee box and I found it even cooler in person. 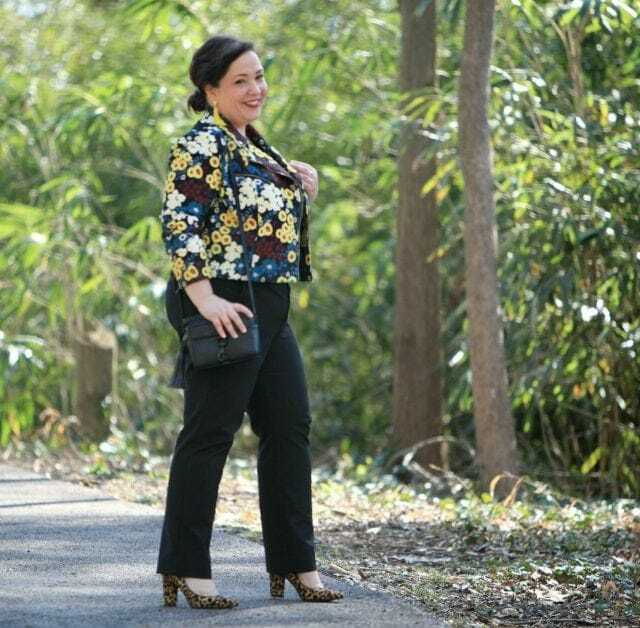 The floral fabric is textured, the back of the sleeves and jacket are black ponte to tone down the print and reduce bulk. Hematite zipper so they don't compete with the pattern. This is really well made – quality materials, and cut to flatter a woman with curves. And hey, a great reason to wear my yellow tassel earrings! I wore it on the weekend with my Ramones tee and grey jeans, but made it work appropriate with a woven shell and suiting trousers. Since receiving this jacket, I ended up acquiring a black ponte blazer also from Rachel Roy's Curve collection (stay tuned I'll be featuring it) and it too is high quality and well designed. 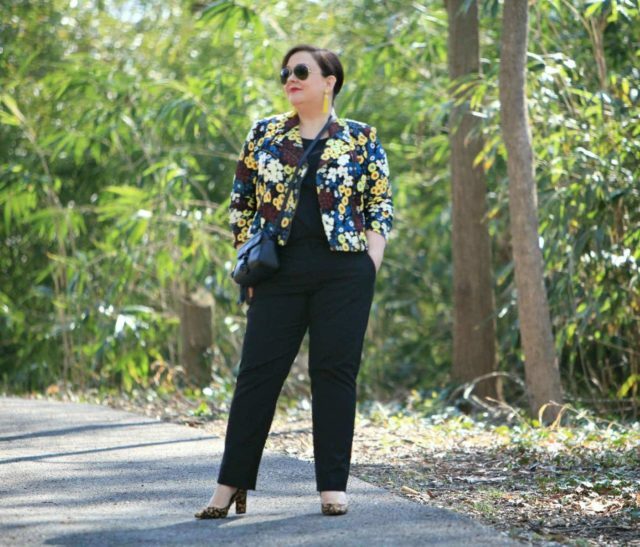 It's refreshing to find such well made and on-trend clothing in plus sizes. As always, if you'd like to try Gwynnie Bee for yourself, use my link for a 30 day free trial of the program! Love that jacket. I looked for it on GB, but now I see your comment about getting it early, so hopefully it appears soon! You look sensational ! Your hair pulled back and the earrings finish off the look beautifully. Wow! 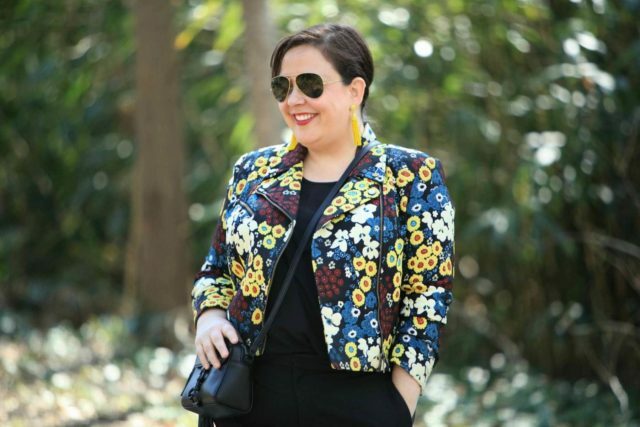 I love this jacket and have to agree with Patricia, the column of color under the jacket makes you look taller. This jacket is TO DIE FOR. I love how you styled it with tassel earrings and fun leopard shoes! You make style look so easy! Out of curiosity, when did you closet that? I am a GB member and don’t see that jacket anywhere on their site. Is it a preview of something they are going to have in the future? I do get things earlier because I am an influencer for GB; it should be arriving very soon as a new arrival. There’s actually some super awesome stuff coming down the pike, I know some will go live next week! I sort of figured that was the case. 🙂 That is an awesome jacket – I had rushed to try to closet it! Thanks for responding. Fantastic outfit and you are glowing! Killer look! 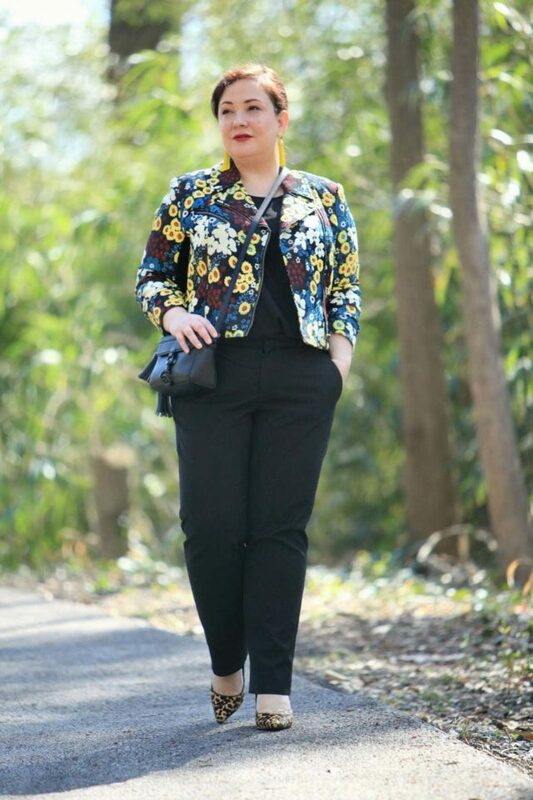 Perfect example how to make your legs look a mile long; solid color underneath and a colorful cropped jacket on top to draw the eye up. It’s a great look, Allie! And I love your haired pulled back like that! !